After surgery comes scarring to heal the wound. Scarring Healing technically happens all by itself. But the natural, default way scar tissue works to heal a wound can limit the potential success of a surgery for Tendonitis. If you want to heal better and heal faster, then learn how to help your scar healing along. When you get a wound, large or small, the body does it's thing to first close the wound, and then heal the wound. Specifically here we're talking about surgery for Carpal Tunnel, Tennis Elbow and Golfers Elbow, Achilles Tendonitis, etc. But all healing happens like this. 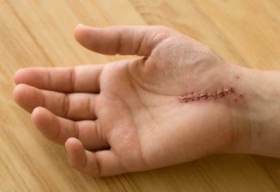 "Carpal Surgery wound and scarring"
1. Surgeon cuts through skin, connective tissue layers, and depending on the surgery, cuts on the tendon(s). 2.. The nervous system detects the new injury and increases the Process of Inflammation. 3. Protein fibers are sent to the area and start latching onto all injured surfaces. This is scar tissue. 4. Scar tissue fibers -pull- together, closing up a wound both with new tissue as well as a literal 'pulling together' of tissue. 5. 'Pulling together' not only happens at the skin layer, but the connective tissue layers underneath, as well as on/around the tendon. Scar tissue will attach to the tendon...and tissue around it. There are two problems with this! Problem #1. This 'pulling together' can and dones cause tightness and constriction. Remember, the point of the surgery was to open things up so movement could happen freely. Problem #2. Scar tissue lays down in all different directions. It is less structurally strong than original structures. So little bits break of from use, and the nervous system notices this and goes 'We're injured again!' and does all the things it does to guard and protect against injury. Thus you get more of the Pain Causing Dynamic. If you do it right and do it enough, you can significantly reduce the amount of scarring after a surgery. But that's not my focus here. If you had Tendonitis surgery or Carpal Tunnel surgery, then you have scar tissue laying down and pulling tissue together. 1. As soon as the cut seals, start Ice Dipping. Reduce inflammation and bring more blood and nutrition to the area. 2. Keep the area mobile. Meaning, rub it just a little bit. Repeatedly throughout the day. The more it heals, the more you can rub it. Think of a dry crunchy sponge. That's what scar tissue tries to become. Keep it like a soft, squishy sponge by keeping it mobile. 3. The more it heals, go deeper. Remember, the cut went deeper than just the skin. You want to get movement into the entire area where scar tissue is laying down to heal you. It's all connective tissue that was cut through, so it's all scar tissue on connective tissue layers. Keep it mobile, keep it soft and squishy. ** Scar Tissue buildup isn't a problem. Dry, crunchy, fragile scar tissue is. Because it frays off and keeps the body thinking injury is in place. Increasing scarring healing is pretty easy huh?!? Don't let the simplicity have you think it's not worth it. We think that surgery recovery and healing should get us back to 100%. This isn't necessarily the case. And we can help our bodies help us feel better by putting in a little bit of the RIGHT self care. Return to the top of this Scarring Healing page. Go to the main Tendonitis page. Go to the TendonitisExpert.com homepage.